We had some out-of-town company this past weekend and I had made up the pumpkin spaghetti sauce ahead of time for trying out with them. Everyone to a person loved it! And the pumpkin cornbread really is amazing. 1. Heat oven to 350 degrees. Grease a 9 x 5" loaf pan with oil. 2. Combine the flour, cornmeal, sugar, baking powder, cinnamon, baking soda, and salt in a large bowl, until thoroughly mixed. 3. Whisk together the eggs, pumpkin, butter, and milk in a smaller bowl. Quickly mix this into the flour mixture until just combined. Gently stir in the walnuts. 4. Pour the batter into prepared pan. Bake for 50 to 60 minutes, or until the loaf is golden brown and slightly separated from the edge of the pan, and a skewer inserted into the center of the loaf comes out clean. Remove from the oven and cool on a wire rack for 10 minutes. Remove from the pan and brush with the glaze, if using. Cool completely before slicing with a serrated knife. Notes: I usually use stevia instead of sugar and decrease the amount of sweetener, despite the fact that that is an insult to my Texas roots. I did not do so this time though, which is why it could pass for cake! Also, I think cornbread served as a loaf of bread it somewhat odd so I put it into a 9 x 12 Pyrex dish and cooked it for roughly 35 minutes instead. 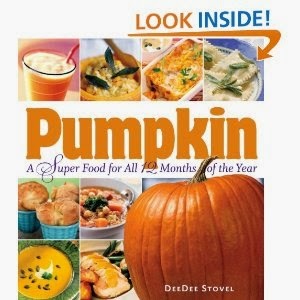 Now, besides giving away a recipe to everyone, Storey has also offered to give away one copy of Pumpkin, A Super Food to one of you! Simply leave a comment (including a valid e-mail address) to be entered into the drawing. This contest is open to U.S. Residents only and will be open through Friday, October 31st. THIS CONTEST IS NOW CLOSED. THE WINNER, as selected by Random.org, IS SHERRY. CONGRATS! Again, many thanks to Storey who sent me a copy of the recipe book in order to facilitate a review. I received no further compensation for these posts and all opinions are my own (i.e., I really do like the recipes!). Ooh, I have to make this. I wonder if I can "veganize" it. Nondairy butter and something to replace the eggs. Hmmm... will have to think over that for awhile and then just jump in and see what happens! Thank you SO much for the recipe! Sign me up for the drawing! This book looks awesome! I would love a copy! Oh, thanks for sharing this recipe! Can't wait to try it. Roasting pumpkin is the only way we use pumpkin--largely because we have a garden full of them every year! I'm glad you learned how. What a great recipe and contest! Kerry skerrysc[at]gmail[dot]com. What a fun cookbook - thanks for the opportunity!